Pricing Decisions – What is the lowest price that We should accept? What is the lowest price that We should accept? The costs in this list are those that may vary directly with production volume. Not every item will be considered a variable cost at some companies. 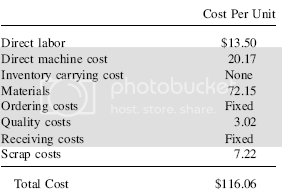 For example, if the purchasing staff is unlikely to be laid off as a result of not taking the customer order, then the purchasing cost is probably not a variable one; the same reasoning can be used to assume that the receiving costs and even the direct labor costs are not really variable. Also, the direct machine costs, such as for utilities and any volume-related maintenance or machine labor, may be still be incurred even if the order is not accepted, and so will not be called variable. Given all these exceptions, it is apparent that the product’s list of variable costs may be quite small (possibly only the cost of materials), resulting in an equally small cost that must be covered by the customer’s price. There are several objections to the exclusion of overhead costs from then pricing formula. First, it may result in extremely low price points that will not allow a company to cover all of its expenses, which results in a loss. Over the long term, this is an accurate assessment. However, in the short term, if a company has excess production capacity available and can use it to sell additional product that generates throughput, then it should do so in order to increase profits. If its production capacity is already maximized, then proposed sales having lower throughput levels than items already being manufactured should be rejected. Second, traditional accounting holds that a small proposed order that requires a lengthy machine setup should have the cost of that setup assigned to the product; if the additional cost results in a loss on the proposed transaction, then the sale should be rejected. However, it is quite likely that a company’s existing production capacity can absorb the cost of the incremental setup without incurring any additional cost. Under this logic, if there is excess production capacity, then setups are free. This approach tends to result in a company offering a much richer mix of order sizes and products to its customers, which can yield a greater market share. However, this concept must be used with caution, for at some point the ability of the company to continually set up small production jobs will maximize its capacity, at which point there will be an incremental cost to adding more production jobs. The third issue arises not from traditional cost accounting, but from government pricing rules. If a company enters into a contract to offer products or services to the government at a certain predetermined price, a key provision of the contract will be that the government will automatically receive the lowest price offered by the company to any of its customers. Consequently, when reviewing new pricing proposals, the sales staff should be mindful of how a new price point will impact any existing sales to and throughput arising from transactions with the government. The owner of Royal Bali has received the request for pricing at the slowest time of the production year, when he normally lays off several staff members. He sees this as a golden opportunity to retain employees, which is more important to him than earning a profit on this order. Consequently, he can charge a price of as little as $116.06 per bike, as derived in the preceding table, though this will leave him with no profit. He has recently hired the production manager away from Easy Bicycles, and knows that Easy has a similar cost structure, except for 20 percent higher scrap costs. Accordingly, he knows that Easy’s minimum variable cost will be higher by $1.44. This means that he can add $1.43 to his price and still be lower than the competing price. Therefore, he quotes $117.49 per unit to the customer. How do We set long-range prices? The pricing decisions just outlined for short-range situations are ones that will bring a company to the brink of bankruptcy if it uses them at all times, for they do not allow for a sufficient profit margin to pay for a company’s overhead, not to mention the profit it needs in order to provide some return to investors on their capital. Proper long-range pricing requires the consideration of several additional costs. How should We set prices over the life of a product? It may not be sufficient to think of long-range pricing as just the addition of all fixed costs to a product’s variable costs. Such thinking does not factor in all changes in a product’s costs and expected margins that can reasonably be expected over the course of its market life. How do We determine cost-plus pricing? There are some cases where a company is asked by a customer to quote a price on a project or product that is so difficult to produce that the company is at great risk of incurring large cost overruns in order to complete it. How should We set prices against a price leader? There may be a price leader in the marketplace who sets product prices. This tends to be a company with a dominant share of the market, and usually the lowest cost structure, and who therefore can control the price of a large share of all products sold in a particular market niche. How do We handle a price war? When there is too much production capacity in an industry and not enough available customer sales to use up that capacity, a common outcome is a price war, where one company lowers its prices in order to steal customers away from a competitor, which in turn matches or reduces these prices in order to retain its customers. How do We handle predatory pricing by a competitor? How do We handle dumping by a foreign competitor? When is transfer pricing important? How do transfer prices alter corporate decision making? What transfer pricing method should We use? And many….many more critical questions in term with pricing decision. Related Topics:Critical Questions About In Pricing DecisionpricingPricing DecisionWhat Is The Price That We Should Accept?